Hunter's Torch is one of two torches in Bloodborne. 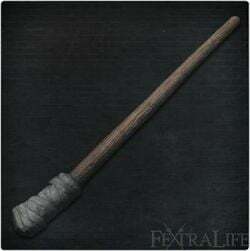 "A torch formed by the wrapping a pine resin cloth around the end of a long stick, once used in Old Yharnam. Designed to incinerate beasts and victims touched by the scourge. Its fire damage is highly effective against beasts." Like the Torch, the Hunter's Torch provides illumination in dark areas, albeit it does have a few differences. Unlike the normal torch, the Hunter's Torch can be upgraded and is practical for combat. The Hunter's Torch has a B scaling for Arcane when compared to the normal Torch. It should be noted this scaling is consistent through all upgradable levels. It's sold by the Bath Messengers in the Hunter's Dream for 2,000 Blood Echoes after locating it in Old Yharnam. At the start of Old Yharnam, follow the "lizard" (Scurrying Beast) and it's in the building you land on the roof of. Beware of the cloaked beast hiding nearby the hunter torch's location. The Hunter's Torch serves as a good choice for Arcane builds due to its scaling and early accessibility. It can be found very early in Old Yharnam. Since "pure arcane" builds have difficulties starting off compared to other builds, this weapon can be a lifesaver alongside the Flamesprayer. Furthermore, many of the enemies you encounter early on are vulnerable to fire damage. It can make Old Yharnam Beasts (the non-cloaked ones) cower in fear at sight of the flame. Keep in mind that you cannot Rally with this sidearm; you'll need to use your primary weapon to take advantage of this mechanic instead. In PVP, arcane users who combine this torch and oil urns can use them to devasting effectiveness. If you douse an opponent with an oil urn and the opponent notices that you're equipped with a Hunter's Torch, they might back away from you for a short while and in the process buying you precious breathing time. The above method also gives you a chance to attack the opponent from a safe distance with ranged weapons/items. The Molotov Cocktail is a useful item for this purpose, alongside the Flamesprayer. For arcane users who enjoy chalice dungeon diving, the Hunter's Torch is an invaluable weapon/utility tool. It provides you with a means of illumination in the darkest rooms of dungeons while giving you a decent damage option at the same time. There is no Quicksilver Bullet cost to use this weapon, meaning it's durable and can last long dungeons. It's currently unknown what exactly is the difference between the Hunter's Torch and the regular torch, other than the former does more damage. A possible theory is that this torch was modified by the Healing Church to aid the hunters of Old Yharnam in burning the town to ashes. Lore wise it's speculated that the Healing Church may have had a hand in burning the town, so it would make sense that they would momentarily arm the hunters of the area with more effective torches. Alternatively, it may have simply been modified by the hunters themselves who burned Old Yharnam down without input from the Healing Church. This idea seems more likely of the two since the description of the Hunter's Torch doesn't mention the Healing Church at all. I would like to comment that this is incredibly effective against brainsucker’s as it just their attack poise and stops them most of the time. There&apos;s a note in the house near the great bridge that&apos;s says the healing church burned old yharnam. Like the normal torch page, I did some cleanup efforts on this page while sharing some knowledge/theories I&apos;ve developed over time. Honestly, this is my second overall favorite weapon in the game, beaten only by the repeating pistol. It&apos;s a real life saver in chalice dungeons on my arcane build, and in PVP people really do not like getting up and personal when doused in oil and you happen to be holding a torch. Nothing too special, but after discovering the power of indented bullet points, I decided it was worth another take. Can you get a variation of this in the chalice dungeons that allows you to fortify it with blood gems?